National forecasts see the potential for continued flooding across the country as we move further into spring. DNR Hydrologist Tim Hall says it is hard to believe we had some extreme areas of drought in the state back in September. The wet fall washed any dry conditions in a trend that’s been seen across the country. “This is the first time in almost a decade that there is no drought in California. In fact — there’s almost no drought in the entire eastern half of the United States. As in zero,” Hall says. 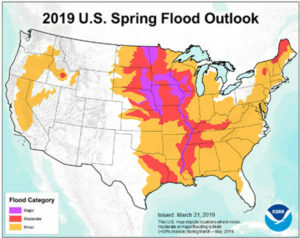 Hall says we can only hope there are enough dry days to make some room in the waterways to handle any of the spring rains.